The Traveling Tripod: Trendy new Florida food choices and photo opportunities. Trendy new Florida food choices and photo opportunities. Are you one of Cleveland's many snowbirds, heading to Florida in February? If you'll be anywhere near Miami on February 11th through February 13th, you'd probably enjoy the grand opening festivities of Florida's newest life style center, The Village at Gulfstream Park in Hallandale Beach. Immediately adjacent to the exciting Gulfstream horse racing track and casino, Forest City Enterprises of Cleveland, OH is planning a weekend-long list of activities for the entire family. "Carnavalia" is the name given to the festivities, treating your senses to the sights & sounds of Latin American performers in elaborate costumes throughout the street scape. Roaming street performers provide their unique entertainment on Thursday and Friday nights starting at 6:30 p.m.
Saturday brings an equestrian treat for the kids from 10:00 a.m. until 11:30 a.m. Meet and greet jockeys and their horses at "Pony Island" in the Walking Ring at Gulfstream Park. Bring your camera and pose with your favorite steed. Photo suggestion: I'd suggest a wide-angle lens, as you may not be able to back up too far. Horses are very big animals and you'll need that wide-angle to get the "big" picture without other people walking in front of you. 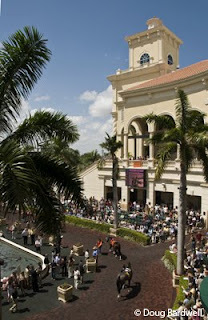 Looking for great food and beverages.....The Village at Gulfstream offers some new and exciting choices. Scott Laslo, Vice President/General Manager said, "We wanted to do something unique that not only captures the energy of South Florida, but also brings in new flavors and influences from across the country and around the globe." To that end, you'll find one of the trendiest new nightlife destinations in Greenhouse Nightclub and the US's first Tonino Lamborghini Cafe Corsa. Also, check out Ola Cuba, La Belle Epoque, Texas de Brazil and The Playwright Irish Pub.